Boils are caused by staph bacteria when it infects the hair follicles or sweat gland. When this happens, initially the skin turns red and a small lump forms in the affected area. Within a week, the swelling increases, the lump will get filled up with pus (1). Usually, boils appear on the face, neck, armpits, thighs and buttocks, but can occur elsewhere on the body too. Though it can affect all age groups, it is more common in people suffering from acne, diabetes, a weak immunity, poor nutrition, bad hygiene or close contact with an already infected person. If the boils are accompanied by fever, pain in chest, rashes or change in the appetite, then it is better to consult a doctor for immediate medical help. In the normal cases, it can be treated at with natural remedies like milk, turmeric, onion and other ingredients. 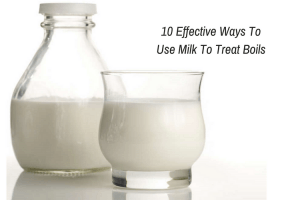 Here let’s have a look at how a simple ingredient like milk can work wonders in treating boils. 1 How Milk Helps To Cure Boils? 2 How to Use Milk to Get Rid of Boils? How Milk Helps To Cure Boils? Milk is a natural anti-inflammatory agent that reduces swelling and redness in the boils by improving levels of inflammatory biomarkers. Raw milk contains a lactic acid called beta-hydroxy acid, which makes it an excellent natural cleanser and exfoliator. It helps to remove dirt, debris, dead skin cells, excessive oil and infection-causing bacteria. Raw milk has a soothing effect on itchy, inflamed or painful boils and helps to keep skin moisturized and healthy. Milk contains Vitamin A which is helpful in treating the boils once they dry up. It also stimulates healthy new cell division to clear up the infected skin. Milk also contains Vitamin B6 and potassium which is necessary for skin cells regeneration and helps to provide relief from the itching while the boils are healing. The Vitamins D and B12 in milk help to even out skin discolorations, dark spots, boil scars and uneven skin. Raw milk and milk cream are effective in shrinking and reducing the open pores on the skin that may be developed as a result of boils. How to Use Milk to Get Rid of Boils? Milk can be used in a number of different ways to treat boils naturally. It can either used alone or in combination with other ingredients that are helpful in treating boils. We have assorted them below for your convenience. Note: Wash the boils along with the surrounding area gently with water and a mild anti-bacterial soap before any application mentioned above. Use a soft cotton towel to pat dry. Do not rub otherwise the boil may pop open. A poultice is a soft, moist substance applied to the body to relieve inflammation, soreness and other problematic symptoms. Milk and bread poultice is used to develop heads in pus-filled boils so that the pus can easily flow out from the boil leading it to dry up soon. Warm 1 cup of milk in a pot on medium flame. In a bowl, add a few bite-size pieces of bread. Carefully pour the hot milk over the bread to let it soften and mix well to make a paste. Apply it directly on the boils and secure it with a bandage or wire gauze. Let the poultice stay on till it dries up. Remove the bandage and wipe off gently with water. Repeat twice daily till the boil ruptures. Turmeric possesses anti-inflammatory and anti-oxidant properties that inhibit the pro-inflammatory enzymes in the body which trigger the formation of boils (2). It is also a natural blood purifier that detoxifies and cleanses the blood, helping to clear up boil infections. Add milk slowly to it and mix till it becomes a fine paste. Apply the paste directly on the boils and let it dry completely. For Added Benefits: Add 1 tablespoon of turmeric into a glass of lukewarm milk and consume it thrice daily for a week. A mixture of milk, salt and flour helps to provide instant relief from painful symptoms of boils and also helps to heal them faster. Heat 1 cup of milk in a saucepan. Add 2-3 teaspoons of salt and a pinch of flour to the milk. Allow milk to cool and apply on the boils. Leave on till it dries. Wipe it off gently using a damp towel. Apple cider vinegar acts as a natural anti-microbial and disinfectant that helps fight skin infections like boils (3). It is also a natural anti-inflammatory agent that relieves pain and neutralizes the pH level of the skin to help the boils heal quickly. Mix 1 teaspoon each of milk cream, apple cider vinegar and turmeric. Note: You can also use white vinegar instead of apple cider vinegar. Nutmeg is a powerful anti-inflammatory and anti-bacterial that inhibits the growth of disease-causing microbes (4). It helps to stimulate blood circulation and relieves the pain and swelling associated with boils. Mix ½ teaspoon of ground nutmeg in 1 cup of hot milk. Repeat regularly for a month to get relief from boils. Black seeds are effective anti-inflammatory agents and analgesics that work to reduce the swelling and painful symptoms of boils (5). They also act as a good anti-pyretic, to help reduce fever in cases of bacterial infections associated with boils. Grind 1 cup of black seeds into a paste. Add ½ cup milk to the paste. Blend it together till it attains a smooth consistency. For Added Benefits: Add 1/2 teaspoon of black seed oil into a cup of hot milk and consume it. Almond oil contains anti-inflammatory, anti-oxidative and anti-viral properties which help to clear the boils. It also heals the scars or dark spots caused by boils (6). Boil ¼ cup of water in a saucepan. Add 1/8 teaspoon of turmeric powder to it. Simmer for 8 minutes until it forms a thick paste. Combine 1 cup of milk and 2 tablespoons of almond oil. Bring this mixture to boil separately. Turn off the heat and combine the two mixtures. Note: You may add a natural sweetener if taste seems unpleasant. Black pepper contains natural pain killing, anti-inflammatory and antibacterial properties (7). This combination works effective in treating and preventing boils. Warm 1 cup of water in a saucepan. Add 1 teaspoon of turmeric and a pinch of black pepper powder to it. Add 2 tablespoons of melted coconut oil and ½ cup of milk. Mix them together and turn off the heat. Sesame oil has both anti-bacterial and anti-inflammatory properties that help ease the painful symptoms of boils and prevent their future occurrence (8). Add 2 tablespoons of sesame oil to 5 tablespoons of milk/milk cream. Heat the mixture for 3-4 minutes. Turn off the heat and add a pinch of black pepper and 1 teaspoon of turmeric powder. Stir well and apply on boils. Allow it to dry and wipe off with a damp towel. Epsom salt works as a drying agent that helps to draw out the toxic pus from the boils. It also reduces swelling and relieves pain. Take ½ cup of milk in a saucepan. Crumble a piece of bread and add it to the milk. Stir continuously, so that it forms a thick paste. Add 1 teaspoon of Epsom salt to it and mix well. Take a piece of clean cloth and dip it in the mixture. Apply it directly on the boils. Secure with a bandage or wire gauze and leave on overnight. Wash off the application in the morning. Follow this procedure on a daily basis. Note: You can use table salt, kosher salt instead of Epsom salt. Do a simple milk patch test on the skin to test for any allergic reaction. Never attempt to squeeze, pop or pierce a boil. This can spread infection to others and lead to further complications in healing. Wash your hands thoroughly before tending to the boil-affected areas of your skin. If you are covering the affected boil with a bandage or wire gauze after topical application of any remedy mentioned above, make sure you dispose off all dressings carefully after use. They can be infective. Include the following foods in your diet: garlic and onion, green leafy vegetables, citrus fruits, natural juices, tofu, sweet potato, oysters and artichoke. Avoid sweets, junk food and caffeinated drinks. Frequent bathing and drying your skin thoroughly after a bath can help prevent the boils-causing staph bacteria to develop on your skin. It is important to wear loose-fitting clothes on the areas afflicted with boils. Constant friction or sweating can lead to this skin condition getting worse. Avoid foods that contain excess sugar, salt or preservatives. Keep yourself hydrated and exercise daily to flush out the toxins and keep your skin healthy. 1. I am lactose intolerant. Does that mean I cannot apply milk/natural milk remedies on my skin to treat boils? Milk allergy and lactose intolerance are two entirely different conditions. People who are lactose intolerant have a problem with the intake of dairy products but they will probably have no problem at all using milk products on their skin. Lactose intolerance only results in digestive problems – such as diarrhea, bloating and abdominal cramps. 2. Can boils be caused due to milk/milk products? In some cases like if you are allergic to milk then it is true. If boils or rashes appear immediately after you consumer milk or any milk products, it would most probably mean you are allergic to them. The best way to find out for sure is to consult an allergist (allergy specialist). 3. I have a pea-sized pimple like growth on my skin since a week. Should I visit the doctor or try a natural remedy like milk to treat it? Since, it has just been a week, you can try any one of the remedies mentioned above in the article. Either it will heal or it will turn into a pus filled lump. If any of these happen, try the milk remedy for a longer period of time to ensure it completely heals and doesn’t recur. However, if you notice the growth becoming larger, spreading to other parts and getting itchy then consult a dermatologist. 4. My partner/roommate is suffering from boils. How likely am I to get infected? How can I prevent infection? The bacteria that cause boils are highly contagious and easily spread through direct contact with infected skin. Do not share bedding, towels, clothes, soaps or razors with the infected person. Use hot water to sanitize your clothes and utensils to minimize risk of infection. Did you find our natural milk remedies helpful? Do you know of any other natural remedies that can be tried at home to get rid of boils? Do let us know your suggestions and experiences in the comments section below.